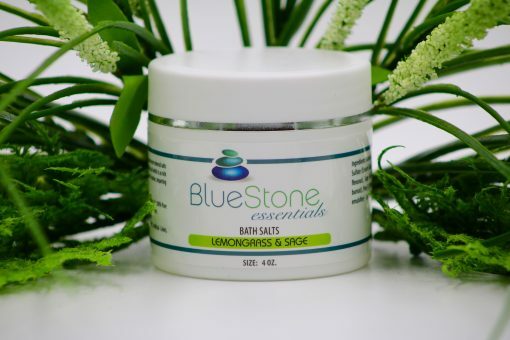 BlueStone Essential’s Lemongrass and Sage Bath Salt combines the therapeutic properties of Dead Sea, Epsom, and desert mineral salts with pure therapeutic-grade essential oils to create a deeply penetrating aromatherapy bath salt which is as rich in minerals as it is luxurious. A bath enhanced with one of our bath salts will make ritual of routine, impart softness to your skin, refresh your body and leave your senses uplifted and at peace. This jar contains enough salts for 6 baths. Simply add one level tablespoon to a warm bath and enjoy! Mineral salts from 3 continents, essential oils from 44 countries, it’s time for a relaxing bath! 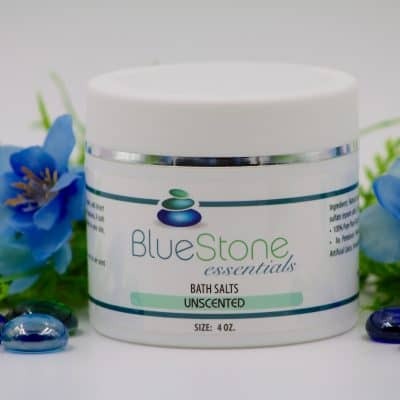 Dead Sea Salts from Israel, sea salt from Mexico and desert mineral salts from Utah all blended with 100% Pure Essential Oils produce a bath that deeply relaxes the body, rejuvenates the skin and soothes the senses. 100% Pure Plant-Based Ingredients, Exceeds EU Cosmetic Directive Guidelines. Ingredients: Natural Sea Salt, Dead Sea Salt, Sodium Bicarbonate (Baking Soda), Magnesium Sulfate (Epsom Salts), Pure Therapeutic Grade Essential Oil Blend: Lemongrass (Cymbopogon flexuous), Sage (Savlia officinalis), Vetiver (Vetiveria zizanioides), Lavendin (Lavendula burnati), Pine (Pinus palustris), Atlas Cedar (Cedrus atlantica), Sulfonated Castor Oil (Natural emulsifier) Certified Organic by Quality Assurance International. I have really bad nerve pain in my feet, and I have started soaking my feet in Epsom salts, an anti-inflammatory Kibosh essential oil blend by Michele, and the lemongrass and sage bath salts, and it has made an enormous difference. Not only does it help with the pain, but I feel totally rejuvenated and relaxed.